Freeman’s Barber Shop opened its doors in downtown Milledgeville in 1968 and has been in operation ever since. Freeman said his father, Robert Sr., was born in Milledgeville but was raised for several years in Sandersville. He and his brother Isaiah were sent to live with an uncle in Sandersville after his grandmother became ill. When she got better, they were able to return and live with his mother and other siblings. Freeman Sr. returned during his teenaged years and graduated from Boddie High School. While young, Robert Sr. got an apprentice license from one of the master barbers in Milledgeville and later became a master barber himself. Freeman said his father had always had the vision of being an entrepreneur. Although he worked several different jobs, he worked where he could still pursue his passion, which was barbering. In 1968, the first Freeman’s Barber Shop opened where the current police department is now. As a black business owner in a Southern city just as the Civil Rights movement was coming to an end, Freeman said his father had a hard time establishing the business. In the 1970s the county told business owners they would have to relocate, Freeman said, due to the planned building of a new police department on McIntosh Street. Freeman said his father moved to 142 N. Wayne St., and the business was located there for years until Freeman bought the building next door. That marked the third and final move of the barbershop, to 140 N. Wayne St., where it has remained for 34 years. It was also in the 1970s that Robert Sr. began teaching his craft. It was during the 1970s and 1980s that Freeman’s Barber Shop faced its most difficult times. Freeman’s Barber Shop has always had a very diverse clientele, Freeman said. Freeman continued teaching the skills necessary to become a barber to the youth at the YDC and worked in his barbershop until his death from prostate cancer in 2004 at age 63. 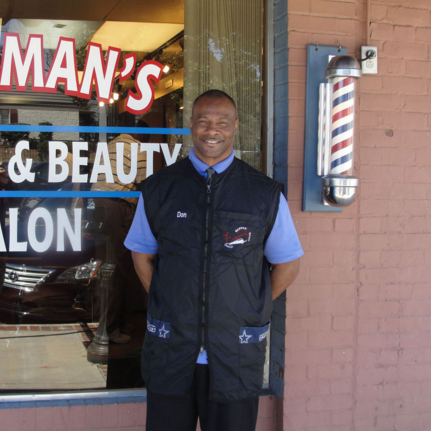 Robert Jr. now owns Freeman’s Barber Shop, though he no longer practices in Milledgeville. “I graduated from Georgia Southern University and was recruited by the federal government,” Freeman said. He now lives in Maryland for his primary job, and he’s opened four additional Freeman’s Barber Shops. The Milledgeville location is managed by Don Reese, Freeman’s brother-in-law. Freeman’s is active in the community, Freeman said, and often holds events and specials. “We do specials for back to school, Christmas and other holidays. We do things for the kids at GMC, especially the ones who have to get their hair cut often with the military style,” Freeman said. Freeman said he tries to tie specials at his barbershops into the work he does in Maryland. “A few months ago, we did free blood pressure screens and had a nurse come down. We did free blood pressure tests for African-American men because they tend not to go to the doctor,” Freeman said. One of the main fundraisers Freeman’s Barber Shop has is for cancer due to several members of the family having the disease. Freeman’s Barber Shop is located at 140 N. Wayne St. Hours are from 8:30 a.m. to 7 p.m. Monday and Tuesday and Thursday through Saturday. The shop is closed Wednesdays and Sundays. It can be reached at 478-452-4396 or online at www.freemansbarbershop.com.